For the last 70 years, baby boomers have been redefining life passages. As teens, parents, and professionals, these men and women pushed boundaries, challenged status quo and reached for all the stars. No surprise, that as boomers reach retirement age, they are looking for distinctive lifestyles and living arrangements. “Sun City: Here we don’t come!” writes Next Avenue staffer Richard Eisenberg about a 2014 boomer retirement housing survey. So, where will boomers, who are now between the ages of 53 and 71, be moving? Boomers have watched, often with surprise, how their parents have thrived at a continuing care retirement community. A CCRC, or life plan community, offers an all-inclusive range of services, for independent living, assisted and skilled nursing, which means residents have peace of mind knowing that they will not have to move because of health issues or physical limitations. Amenities abound, from maintenance free features to having access to a fitness center and swimming pool, daily meals, entertainment and educational opportunities. Some younger retirees think they are too “young” to move to a retirement community, and may move to their “first” retirement home, before moving to a CCRC. For instance, the average age at joining Kendal at Oberlin is 74 years old. Since one of the key benefits of living in such a community is its amenities and variety of activities, moving when you are younger and healthier allows you to fully enjoy all the benefits for a longer period. With a focus on independent living and preventive care, residents can take advantage of meals, exercise and other activities that promote a healthy lifestyle. Opportunities to make new friends with people of all ages abound in communities like Kendal at Oberlin, preventing isolation and loneliness. 4. A Window of Opportunity. “Continuing care contracts generally require that residents must be able to live independently and that they are not at an increased risk for assisted living or healthcare services. Therefore, many communities will perform a health evaluation on prospective residents as a part of the application process. Those who do not meet the community’s health criteria can be declined for entry and miss the opportunity to benefit from what a continuing care retirement community offers,” Brad Breeding explains. We all know that moving and making major life changes can get more difficult with age, so adapting to a new place is likely to be easier when you are younger and healthier. One interesting twist is emerging too. With so many baby boomer parents living well into their 90s and beyond, some boomers are opting to move into the same CCRC as their parents. “Having the comfort of knowing an elderly parent is down the hall in an apartment or across the street in the community's care facility can create an immense sense of relief,” Brad Breeding writes. Enrollment at college campuses swelled during the 1960s and 70s, and many of these educated baby boomers want to move back to a college town. Campuses offer a myriad of activities, many free, from lecturers and poetry readings to sporting activities and concerts. Often older adults can audit a college class at no charge, and use the library, fitness center and other amenities at a free or reduced cost. 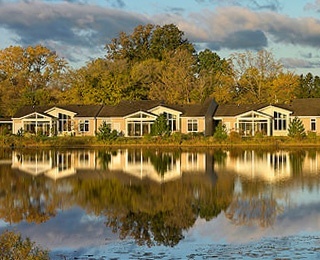 George Mason University Professor Andrew Carle coined the phrase “university-based retirement communities” (UBRC) to describe this trend being propelled by boomers’ interests. “They want active, they want intellectually stimulating, and they want intergenerational retirement environments.,” he says. Carle estimates there are about 70 retirement communities with ties to a nearby university, but only about a dozen meet his criteria for being a successful UBRC. Kendal at Oberlin in Ohio is three blocks from Oberlin College. The flat terrain makes it easy for residents to walk or bike to campus. Residents can audit courses, free of charge, with the professor’s permission. Mentoring and other intergenerational programs connect residents with students. About 37 percent of residents have some affiliation (alumni, former staff or faculty) with the college. Kendal at Hanover is a seven-minute drive to New Hampshire’s Dartmouth College. More than half of the residents are members of Dartmouth’s Institute for Lifelong Learning at Dartmouth. About 25 percent of residents have some affiliation with the college. Kendal at Ithaca is within a short driving distance to two New York higher education schools – Cornell University and Ithaca College. Residents participate in various aging research projects with the two schools. Students and residents interact through various class projects. Across the country, from urban centers to rural towns, older adults are joining with men and women of similar age and multigenerational to create their own community. The cohousing movement has been spearheaded by architect Charles Durrett and his wife Kathryn McCamant. "Cohousing, by design, is a social agreement where people know about you, care about you and support you," says Charles, author of Senior Cohousing: A Community Approach to Independent Living. There are about 165 cohousing communities, with another 140 forming, involving people of all ages. Elements of a cohousing community include private homes with a common house for dining, meetings and other communal activities; an architectural design that fosters community, such as front porches; and operating rules like a housing association. "The individuals pick the community. The community doesn't pick them," Durrett says. "There is no such thing as like-minded people. Wait until you get into a discussion about cutting a tree down." With about six out of 10 older adults planning to move, that leaves 4 out of 10 planning to age in place. Older adults are renovating their current homes to make them more user-friendly and enlisting the help of business, community and health services. Are you thinking of renovating? “Find a contractor now,” urges New York Times aging reporter Paula Span. “About 3,500 Certified Aging in Place Specialist graduates across the country — builders and remodelers, occupational therapists, interior designers — retrofit homes to help people remain in them safely”, said Dan Bawden, a Houston contractor who helped develop the program in 2001. I asked how many it would take to serve all the older and disabled Americans who want to age in place. ‘Ten times the number we have now”, he said. Also, research what community services are available in your area. Kendal at Home is a unique, life plan at home program. The program is currently only available in Ohio, but expansion is on the horizon. When you join Kendal at Home, you immediately receive the support of a personal life plan coordinator, who will learn about your lifestyle and preferences. Together you and the coordinator develop a personalized program with supportive services so you can remain in your home.